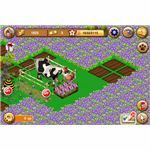 Tap Ranch 2 is a grow over time farming game in the tradition of Farmville with a variety of crops to plant, animals to feed, money to be made and friends to make. It also uses the same business strategy as that game which allows you to play the game for free, but charges you to allow you to advance more quickly than you otherwise could. It also has many of the same strategies which means that there is no real way to lose Tap Ranch 2, but you can improve far faster if you know how to play well. This is a very simple game on the surface. You simply plant crops and after some amount of time you harvest them, making more than it cost to plant them. When you start the game that is exactly what will happen with very little to do until you grow a few crops. While you can play the game entirely like this if you want, it isn’t the best way to play the game. Instead, you have the option of planting something like alfalfa, which you can then harvest and sell. Or you can use bees to create honey from the alfalfa, then after they are done also feed that alfalfa to the cow creating milk. You can then turn that milk into cheese. This allows you to earn a considerably higher amount of money in the same amount of time. This style of gameplay does have a drawback though. Since you have a number of things to do there is a bit more complexity in playing. In addition, it can force you to micromanage. The complexity isn’t enough to really be a problem. You simply have to go into the barn occasionally and sell things rather than them selling automatically. The micromanagement on the other hand has been addressed by the developers. You can occasionally get Op points. These can then allow you to temporarily automate processes. Another process added to make interest in the game last longer is quests. At the beginning these simply encourage you to experiment with different types of crops, but as you advance they become more complex. These allow you to get new animals, but have several steps, such as collecting 10 carrots, buying a cherry tree and getting both a hay bale and wooden barrel. By completing that quest you can unlock a pet, though you also get money and experience for these quests as well. The graphics of Tap Ranch 2 are quite good, if reasonably simple. The crops themselves each look different enough that you really can tell what each type of crop is and they even have some fun bonuses such as crops for each letter so that you can write things in your game. The animals look even better. The cow that you begin with looks like it could have stepped out of any cartoon and even the tiny bees look reasonably good, though it is hard to see them. The music is a bit less impressive, but it isn’t actually bad, it is simply forgettable. The good news, though, is that this does not stop you from playing your own music. This is always good in an app, but it is better with this type of app that you’re likely to start and stop often. The biggest weakness of Tap Ranch 2 is not that it takes a bit longer than some of the other similar games to get started with, but the desire of the developers to earn money. This is because each time you start it not only encourages you to spend money on this app, usually by trying to get you to expand your farm, but it also has a recommendation for another app. This isn’t a huge deal, but as this is the type of app that encourages you to check back regularly as crops grow it gets old pretty quickly. So, while it is understandable from the point of view of the developer it still makes the game one that is harder to recommend. 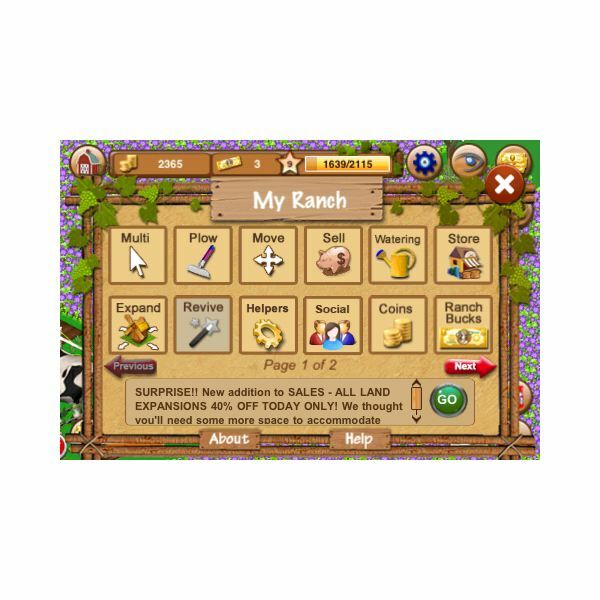 While similar to other games the differences in Tap Ranch 2 allow a lot of strategy. The most important strategy is to avoid having crops which do only one thing. For example you can grow and sell alfalfa and make some money doing it. Far better though is to have a bee hive, a cow and a cheese maker. This will allow you to grow alfalfa, have the bees collect honey from it, then feed it to the cow to get milk and finally use that milk to create cheese. While this will help with money, even more importantly it will aid in gaining levels, as each step will allow you to get to the better crops faster. Also important is the automation. Each level you will get some automation points. This will allow you to order one of your animals or makers to run automatically that many times. To get maximum value out of this you'll want to use it when you leave them game as it will work even after you have gone. It is also a good way to get a bit of extra experience and money so make certain to take advantage of it. It takes a lot to stand out in a genre of games as crowded as iPhone farming games -- flooded since the success of Farmville. Yet, Tap Ranch 2 really does find ways to make this a far more interesting game than many of the others. While it is a bit difficult the first time you start, without much money and not all that much to do until crops have grown, if you give it a chance this game has the potential to keep you occupied for quite a lot of hours. It is a bit more in depth than some of the similar games out there. Images, author's iPhone screen captures.